ET Law is premium unique Responsive Law WordPress theme that targets for lawyers, law firms, lawyer referral services, judiciary information, and other related websites. Law WordPress Theme is of high technical quality and good aesthetic design. It builds with Genesis Framework, shopping cart support by WooCommerce. Fully-compliant, cross-browser compatible and responsive for all devices, our legal templates are as robust under the shell as they are stylish out front. Contact forms are included within these templates, as is Google Map integration for showing your physical location to prospective clients. Being SEO-friendly, these WordPress Legal Affairs Themes will provide better online visibility and ensure great rankings. 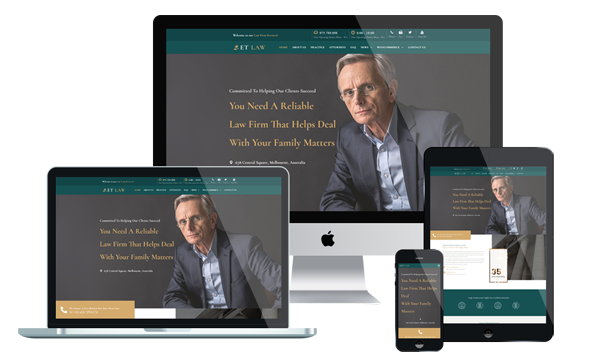 Much cheaper, much quicker, and arguably more professional, our Law WordPress Theme is ideal for small, medium and larger firms of attorneys.